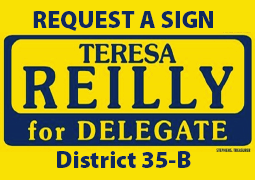 Having scored above 80% in ACU’s 2015 Ratings of the Maryland General Assembly, Delegate Teresa E. Reilly will receive an award at ACU’s Conservative Political Action Conference (CPAC) on March 2-5 at the Gaylord Resort and Convention Center in National Harbor, Maryland. The conference is attended by thousands of conservative activists around the country and is currently the third largest covered political media event in the country. ACU researches and selects a wide range of bills that reflect a member’s adherence to conservative principles. They select bills that focus on former President Ronald Reagan’s philosophy of the “three-legged stool”: 1) economic: taxes, budgets, regulation, spending, healthcare, and property; 2) social and cultural: 2nd Amendment, religious freedom, life, welfare, and education; and 3) government integrity: voting, individual liberty, privacy, and transparency. The range of issues selected have been specifically designed to convey to voters the most accurate assessment of Maryland’s elected official who can be counted on to defend the principles of a free society: Life, Liberty, and Property. Like their Congressional ratings, ACU’s State Ratings reflect how elected officials view the role of government in an individual’s life. Maryland legislators with the strongest scores consistently voted with the ideals articulated in our U.S. Constitution.